After a long wait, I finally have a few moments to post again! With the onset of Summer, the work in the garden (and everywhere) expands to encompass a lot of tasks, some large, some small. But every now and then, I have my camera at the right time, and I get lucky by taking a good photo (the vast majority of my photos are scrapped, poor quality or not in focus). The Echinaceas are in bloom now! For many, it is their first year to bloom from seed. Bees and butterflies adore them, particularly the bumblebees. Honeybees, while I have seen them visit in past years, do not seem to go too crazy for them if there is more appealing forage available. I am hesitant to call the species on many of these Echinaceas, since most are probably of hybrid origin from at least two of the nine species. The insects do not care what they are, the nectar is available to them whatever the species. The hardened "spikes" which comprise the "cone" of the purple coneflower (the common name of Echinacea) likely reduce the visitors to the ones who have the longer probosces able to reach the nectar hidden within, to the exclusion of small tongued insects like flies. This Coreopsis has self sown at the base of one of the raised beds in front of our house lining the driveway. The plants grow very tall, over four feet, and are preferred to the weedy invaders that would have grown there otherwise. Butterflies like this one have visited somewhat frequently. It is common on many of the relatively "shallow" flowered plants (having short floral tubes, easily accessed nectar) to see small insects and beetles. A telltale sign that they are present is their waste left behind as small reddish-brown spots on the petals. Here you can see at least five nectariferous insects, the likes of which are very common in my yard. I'm not sure if they are true beetles, but they appear to have a pointed projection coming off of their faces that they use to plunge deep into the florets, seemingly for the nectar. Another example of the nectar-seeking bugs on a daisy, in this case a Shasta daisy. In the Asteraceae (known as the aster, composite, daisy, or sunflower family) the inflorescence is typically comprised of a disk of tiny florets. The outermost florets, usually called "petals", are actually sometimes sterile or partially sterile florets called ray florets. The disk florets are what make up the "yellow" center. The disk florets open in the outermost edges and work their way in. In this flower, the outermost ring of disk florets has begun to open, which is also where the insects happen to be (no coincidence). Though I have noticed over the years that most large bees have been uninterested in Shasta daisy's, this small species of solitary bee has now been spotted two consecutive years. The yellow disk is smaller than a quarter, the bee is less than one quarter inch long. Here is a good angle showing the open disk florets, and this small bee's proboscis (a straw-like tongue). The small stick-like projections coming out of the disk florets are the stigmas. Nectar is produced probably at the base of the stigma or at the top of the ovary. Each disk floret, and sometimes the ray florets too, will produce a single seed. Think of a sunflower, same basic flower construction. Each tiny floret in a sunflower produces a single sunflower seed. The same goes for Echinacea, Leucanthemum, Coreopsis, and most if not all of the "daisy's" of the world. My lawn looks like this from about 8AM to noon, when these flowers are open. Hypochaeris, or sometimes "cat's ear", is an invasive dandelion-like plant. They grow over a foot tall, and reproduce asexually through both crown divisions and apomixis (asexual seed production, in a nutshell). The plants can endure extremely harsh conditions, including being covered by a sheet of plywood for a month. Try that with your pansies, the result can easily be predicted. No matter, bees of all sorts love these, and so I don't feel so bad about neglecting the "lawn". As suggested, the flowers are only open from sometime in the morning when the sun comes out to the point when it gets too hot, maybe around noon. This allows them to conserve nectar and to prolong the life of the flowers, an inflorescence composed of florets (Asteraceae), increasing the chance of cross-pollination. Many other types of insects visit Hypochaeris. Beetles like this one can sometimes be found, though they are more likely pollen thieves, eating pollen and flower parts instead of moving pollen from flower to flower. Of course, I'm fine with this because of the invasive nature of this species, though the lack of a few beetles pollinating the flowers must hardly have an affect on the population. This beautiful fly, like a giant syrphid (though I could not ID it), was kind enough to let me take some close-ups. Some flies can have a large impact of the reproduction of a particular plant species. Whereas bees are the most efficient pollinators, flies are perhaps the most numerous and the most tolerant of harsh conditions. Flies are the dominant pollinators in high altitude environments ("Alpine"), tundras, forests, and probably others where bees may be present but struggle. Flies tend to be able to function in a wider range of temperatures and light levels, unlike bees which more or less require a somewhat narrow range of conditions. 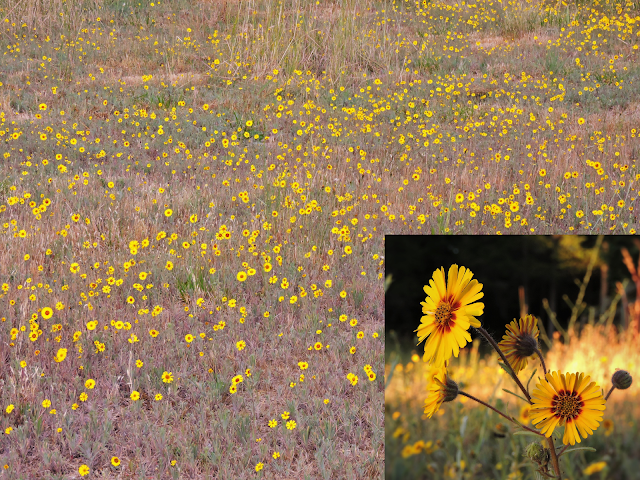 While the Hypochaeris dominates the man-made "lawn" surrounding our house, Madia elegans dominates a large section of the unaltered field behind our home. It grows in a section with a Northern exposure that gets more shade than the rest of the field (which is surrounded by trees, mostly conifers with a few oaks and madrones mixed in). Similar to the "cats paw", the flowers of Madia are only open at certain times. However, they open at dusk as the sun sets and remain open throughout the night until the sun shines on them in the morning. The flowers are variable in shape, size, and color. Some remain short, less than six inches tall, while others reach over two feet. Some have conspicuous red centers while others are mostly yellow with only a hint of a darker yellow at the base of the petals. The number of disk florets also seems to vary considerably, but I haven't counted to see if they vary in size or number. I had once planted seed in a raised garden bed with rich soil, it resulted in a gigantic multi-branched plant with dozens of flowers. The plants emit a resinous odor, both in the air and when crushed, perhaps having something to do with the glandular hairs covering the foliage. I have speculated, upon seeing tiny insects stuck and deceased on the plants that the sticky hairs protect the plants from insect damage. This is backed up by my lack of an observation of insect-munched leaves/etc. Beetles like this one are the most common and numerous visitors of Madia elegans, here shown in the afternoon as the flowers have slowly started to open for the evening. Aside from beetles, small bees, none of which have had the decency to allow me to photograph, have visited the flowers in the early morning and even at dusk when most bees (besides bumblebees) are no longer active. It makes me wonder if there are bees that feed exclusively on Madia, or are just lucky to recognize the abundant resource. Last year I observed a few honeybees working the flowers in the early AM, but there were few visitors and only in the warmest sector of the plant's distribution around my house. Moving on to something quite different than composites, these are the last of the native bulbs (technically corms, a bulb-like structure of what is essentially a section of stem modified to store starches, differing from true bulbs which are composed of leaves or "scales" modified for the same purpose; think of an onion). Interestingly of the Brodiaea complex (Dichelostemma, Triteleia, and Brodiaea), the latest to bloom happens to have the largest flowers. This is strange to me because it blooms in the summer, right now reaching highs of over 100° F. I have seen tiny bees in the flowers in past years, but no bees during my observations this year. I could not tell what this insect was, possibly some type of fly. Although i have not seen any bees on these this year, I have seen many other types of insects. I made one observation of a butterfly, a skipper, visiting a single flower. Besides that I have seen a range of insects such as what I believe is a Katydid nymph of some sort. Katydids are omnivorous, but mostly feed on leaves. I have seen some, mostly at night (they are mostly nocturnal) feeding on nectar from flowers. I am sure that their role in the garden is mostly beneficial, similar to the role of pincher bugs. My first year growing the "drumstick alliums", I have mixed feelings. One caveat I have encountered: squirrels have ravaged a single raised bed for these bulbs as well as bulbs of Allium amplectens 'Graceful', leaving me only with the lifeless scape and doomed flower bud, and a lot of disappointment (OK I'll admit it: it was FURY!) But my temper was eased realizing that they left the other beds with these bulbs untouched, either too ignorant of the bulbs presence in those beds or unwilling to venture too far from the protective canopy of the trees that closely border the defiled raised bed. My delight with this species that has had such mixed reviews from gardeners is that it is visited frequently by both honeybees and bumblebees, as well as some small solitary bees! This is good news, particularly about the honeybees. Not all Alliums are created equally when it comes to pollinator attraction, or even the types of bees they attract from species to species. Allium amplectens was primarily visited by flies and a few solitary bees when it was in bloom, and Allium ampeloprasum var. ampeloprasum (elephant garlic) has from year to year consistently been attractive to wasps, small solitary bees, and hummingbirds to the exclusion of other bees. Allium sphaerocephalon has been attractive more or less primarily to honeybees, bumblebees, and small solitary bees like the one in this photo above. Similar to Allium ampeloprasum var. ampeloprasum, the florets do not open fully like in other Alliums but remain relatively parallel to each other with protruding anthers. Bees have had no issue getting at the nectar, they have all been observed to dive their heads into the florets, while likely collecting pollen only in consequence and not necessarily by intention. This was one of the first bulbs I had ever planted in my garden over four years ago. Unfortunately, I have no idea which species it is because I had not cared about plant names at the time I planted it. No matter, it has been a good performer in my garden, being ignored by deer and rodents. I planted the bulbs in two places, one in shade and one in my small rock garden (a raised bed with an Eastern exposure), both have done well but the sunnier planting has increased better. 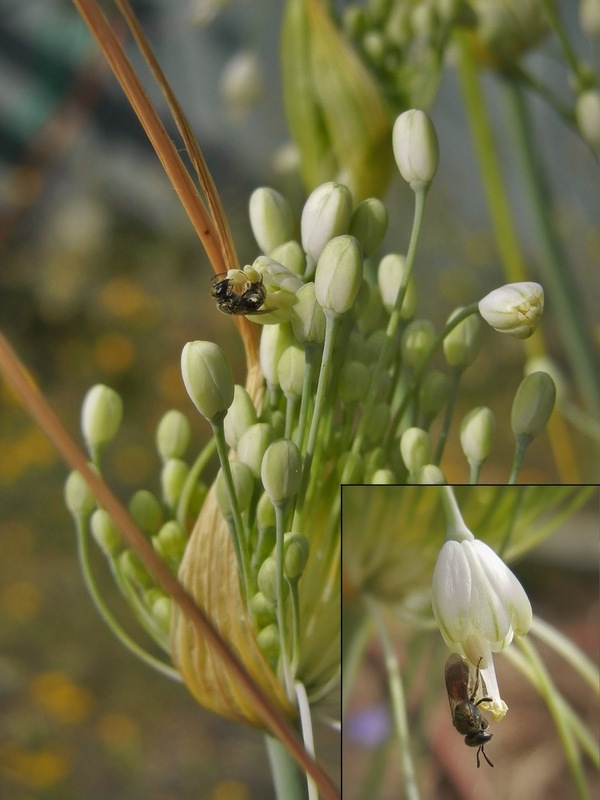 Few pollinators seem interested in this onion, except for very small bees like the one shown. Another prolific bulb (in reality a corm, like Brodiaea) that has returned well is the hybrid Crocosmia 'Lucifer', a cross between Crocosmia masoniorum × Crocosmia paniculata (in the Iridaceae, making Crocosmia an Iris relative). Being the hardiest known Crocosmia, it is a good choice for Northern gardens. It is also exceedingly easy to grow, basically requiring a decent enough soil to grow most any perennial, some water, and sun. A huge plus for me: deer and rodents have ignored it! In my garden hummingbirds are frequent visitors. This poor shot was taken at a distance early in the morning last week. The hummingbirds tend to work the plants early in the day when it is coolest. Their skittish nature means getting a better photo of them in the act will be difficult, if even likely at all. I still feel pleased to have seen the bird at work. It should be no surprise that beetles have even been found here, inside the red tubular flowers of Crocosmia. While there is some pollen to be eaten, it seems more likely to me that they were there for the shelter and not the food. This photo was taken over two weeks ago, and we have recently been experiencing days reaching over 100° F, so no beetles have been seen there since. A plant that most may have been familiar with in the past is bindweed, a smaller flowered relative of the morning glory. While these plants will take root and never vacate, the gardener can at least rest in the fact that they are providing life for somebody. In this photo are actually two different types of beetles (at least the two in the center are true beetles, the one in the upper center may be something else), and what I think is an extremely tiny bee towards the lower right edge of the flower. I attribute this tiny vague character to that of a bee instead of a fly by the long antennae and the way its wings are folded. I am always even more pleased to discover that native bees can make use of a foreign flower. Knowing that the weeds do in fact facilitate the lives of insects like bees, effectively vegan creatures, gives me peace in my mind and warms my heart. My instinct is to become angry at the helplessness of the situation of being overrun by invasive weeds, only to let it all go seeing that life has a way of dealing with it in a way that benefits all. For years I wrongfully assumed that this was some obscure genus in the Ericaceae because of the shape of the flowers and the leaf characteristics. Dogbane, as I have learned, is related to Vinca (periwinkle) in the family Apocynaceae. Nonetheless, these plants can endure some harsh treatment as individuals have survived being trampled for years, buried, pulled, and mowed, only to regrow and flower happily the following year. Though they may be locally common, they do not appear to receive a lot of floral visitors. Here a pair of small beetles forage for floral rewards while also attempting to mate, though the mating is something I had noted from a separate photo taken during the same observation. There are two or three species of bumblebees here. One I believe is the Western bumblebee (Bombus occidentalis), but the others I am not sure. There is one species I do not see often that has a bright orange belt. This one photographed visiting the lavender is perplexing. It most closely resembles a species seen on only rare occasions in North America, otherwise common in Europe: Bombus distinguendus. But I would need a second opinion. They seem to favor the lavender as well as other mint relatives. Honeybees have had less interest in the English lavenders than the Spanish lavenders (Lavendula stoechas and related hybrids) which are earlier blooming. Oregano has taken over a section of a circular herb garden surrounding the base of a specimen Pseudotsuga growing close to our vegetable garden. The mint relative has shown to withstand extreme drought and strong competition from the tree roots. Also, it flowers reliably every year and attracts a wide range of bee types. Small solitary bees of various forms, honeybees, and various species of bumblebees visit the flowers for the nectar. This is a dwarf Veronica that I forgot the name of. I planted it in a South facing raised bed along with Thymus serpyllum, Sedum album, and Echinacea, the latter of which towers over the diminutive creeper. Against my bet that it would be smothered by its eager neighbors it has performed well and has started to spread nicely. The short flower spikes, less than six inches tall, add a nice contrast to the white flowers of Sedum album. It receives few visitors, but that is more likely the result of so many other plants in greater quantities flowering nearby, even in the same bed. As well as the plants mentioned, the bed also contains a large mounding perennial Coreopsis (it grew from seed that apparently appeared out of nowhere because I didn't sow it! ), Hyssopus officinalis, Gladiolus hybrids, and more that I can't remember. I have featured this Campanula before and mentioned how it has shown to receive little attention from pollinators. Just recently I witnessed this large solitary carpenter bee (in the genus Xylocopa) as well as some bumblebees visiting the small blue bells. Both the carpenter bee and the bumblebees stole the nectar by accessing it from the side at the base of the corolla. This plant has grown larger every year, but only incrementally, which is a good sign for a plant. A plant that is too eager too quickly should be approached with caution and should be watched very carefully so it does not dominate the garden and take over. Another plant that has had a bad reputation in some gardens for its eager spreading is Echium vulgare. To be honest, I'd be delighted if it decided to spread around a bit, as long as it didn't decide to spread into the "wild" parts of the yard and adjacent natural areas. Bees of all types continue to worship this famous bee plant, and it remains vigorous even in the extreme heat we have been experiencing. Borage is nice, it has naturalized itself in my vegetable garden. It reseeds exuberantly so if one wishes to have a formal garden, this is not the plant for you. The fact that it will return from seed so reliably means that I can remove plants and cut them back at will. Though they are fairly tolerant of the heat, they have about the same water needs as tomatoes so will not spread into dry parts of the yard, or if they do they will die as soon as the rains quit. The plants can grow very large in good soil, and have the tendency to flop over partially or fully. They are vigilant plants and can tolerate being sliced and diced if the need should arise, the cut pieces are excellent fodder for the compost pile or as an organic mulch. A word of caution: fine hairs that cover the plants (this goes with Anchusa as well) are irritating to the skin, especially on the older growth, and so gloves should be warn when cutting back. Alternatively, don't use gloves and experience the enlivened feeling of getting pricked by tiny translucent itchy needles. To put the plants mentioned above into perspective, the real menace to the Pacific Northwest is the blackberry, Rubus armeniacus (formerly R. discolor). It was an agricultural crop that escaped by way of viable seeds that were spread by birds or other animals. Blackberry can grow to over ten feet and almost infinitely wide and will smother anything in it's path. There are two types of canes. The flowering/fruiting canes are two years old and will remain shorter than the other type. The second type of cane I have observed grow great lengths their first year of growth, creating huge branched arches, but will not produce flowers. The long first year canes root where they touch the ground, sometimes over ten feet from the original crown. After flowering, the second year canes die. Dense thickets are formed under the current growth, creating habitat for a vast variety of animals, including feral cats. Blackberry will grow almost anywhere, including dry fields, but are particularly keen to dominating riparian habitats, even growing some distance into the water itself. It gives me great pain wondering what has been lost when I look upon an acre of blackberry or looking at miles upon miles of blackberry infested stream side habitats. I find some comfort knowing that the wildlife (and honeybees) can make use of the vile plants, even if it means they are making more seeds to colonize as yet blackberry-free landscapes somewhere far away. The flowers in a locale will provide a massive amount of forage for bees in about a two week period, similar to fruit trees (to which blackberry is related, it is in the Rosaceae). Where it is common, there could be millions of flowers in the flight radius of a honeybee hive. Many types of bees visit the flowers for both nectar and pollen. In the current 100°F+ heat we have been enduring, I wonder if the life of the pollen is shortened by the sheer drying effect. Parsley is a biennial, so will flower and die in its second year, and start the cycle anew. Parsley is a good "beneficial bug" plant, producing myriads of tiny shallow flowers in an umbel of the typical Apiaceae form. Larger bees do not seem too interested, but there are two tiny black bees and a beetle like insect in this photo. Other insects that may benefit from plants like this in a garden are the predatory "good bugs" like ladybugs (aphid eaters) and lacewings (a nocturnal predator, you are unlikely to see them). Not in the garden but filling the field behind our house is the nonnative wild carrot. The white umbels are pretty, and feed many short tongued insects. Wasps of various forms will feed on the flowers, as well as tiny bees. The most common visitors are a variety of flies and beetles as these photos illustrate. One strange thing about the flowers of wild carrot, or Queen Anne's lace, is the single red flower in the center of the umbel. Nobody knows its purpose, except possibly as a guide or attractant for insects. This tachinid fly feeds on the flowers. Tachinids are predatory parasites of other insects, applauded in organic gardening because they feed or parasitize some known garden pests. Trichodes ornatus is a parasitic beetle that lives in the nests of solitary bees, feeding on the larvae and stored food until they are mature at which point they become floral feeders. The beetles visit primarily yellow, orange, or white flowers to forage. Though they parasitize bees, a healthy parasite population will suggest a healthy host population. These beetles may act as pollinators, being quite hairy and able to transport pollen from flower to flower. Back to the garden, the towering celery-like plants of lovage are in full effect. Growing to an excess of eight feet tall, I grew these from seed several years ago by surface sowing directly in situ. The plants are highly attractive to a variety of wasps, ants, and moths. I have seen honeybees on the flowers, but only on a few occasions. The plants can be used (sparingly!) in place of celery in soups or as a seasoning, having a stronger flavor. i leave you with this perplexing image: a solitary bee appears to forage on the long-past-due flowers of a hybrid Euphorbia. I can think of no other explanation for why this bee was there except that there was still some floral reward to be gained from the strange and unique floral structures of the Euphorbia plant.